Acetic acid, beta-carotene, betaine, caffeic acid, calcium, copper, coumaric acid, fatty acidsferulic acid, , folate, iron, lecithin, lycopene, magnesium, manganese, p- scopoletin, phosphorus, potassium, selenium, sulfur, vitamins B1, B2, B3, B5, C, and E, zinc. Nettle contains formic acid (found in the stings and bites of many insects, mainly ants. ), mucilage, mineral salts, ammonia, carbonic acid and water. These elements, along with phosphates and a trace of iron, make nettle a valuable food source and medicinal tool. The Nettle plant is considered a weed. The stem attains a height of 2 to 3 feet. Its perennial roots are creeping, so it multiplies quickly, making it somewhat difficult to remove. The whole plant is downy, and covered with stinging hairs. Each sting is a very sharp, polished spine, which is hollow and arises from a swollen base. In this base, which is composed of small cells, is contained the venom (formic acid), the active principle of which is said to be bicarbonate of ammonia. When the sting pierces the skin, the venom is instantly expressed and injected into the offender causing resultant irritation and inflammation. When the plant is cooked, the burning property of the juice is dissipated by heat. Nettle, when boiled, can be eaten as a pot-herb. The juice of the Nettle is an antidote for its own sting, bringing instant relief when applied. The sting of a Nettle may also be cured by rubbing the area with Rosemary, Mint or Sage leaves. Nettle should be harvested on the morning of a mild day, when the sun has dried off the dew. Cut off just above the root, rejecting any stained or insect-eaten leaves. Tie the plant in bunches, about six to ten in a bunch, spread out fanwise, to dry. Hang the bunches over strings. If dried in the open, keep them in half-shade and bring indoors before there is any risk of damp from dew or rain. If dried indoors, hang up in a sunny room or a well-ventilated room by artificial heat. Care must be taken that the window be left open by day so that there is a free current of air and the moisture-laden, warm air may escape. The bunches should be of uniform size and length, to facilitate packing when dry, and when quite dry and crisp must be packed away at once in airtight boxes or tins, otherwise moisture will be reabsorbed from the air. Nettle is classified as an astringent. It has the property of tightening or contracting tissues and drying fluid secretions. Burns may be treated with Nettle by applying linen cloths, soaked in tincture, with frequent re-application. An infusion of fresh Nettle leaves is a soothing and healing lotion for burns. 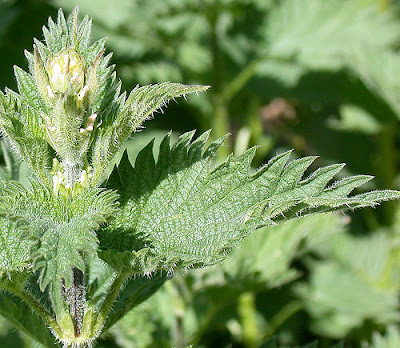 Nettle is a hemostatic, meaning it stops bleeding. This property combined with the astringent property make Nettles a valuable first aid dressing to wounds of the skin. Additionally, Nettle is an analgesic (substance that reduces the sensation of pain). This pain relieving property makes nettle useful in applications for the treatment of rheumatism, rheumatic gout, arthritis, nettlerash, bruises, and chickenpox. As an ingredient in hair care products, Nettle helps stimulate hair follicles and regulate scalp oil buildup. Nettles support healthy skin, hair and nails as they contain the beautifying mineral sulphur. The diluted juice provides is useful as an astringent gargle. The hemostatic property of Nettle is applicable internally. An infusion of the dried herb, or alcoholic tincture made from the fresh plant, or the fresh Nettle juice itself in doses of 1 to 2 tablespoonsful can be used to treat bleeding from the nose, lungs or stomach. For a nosebleed, moisten a clean cloth or piece of cotton with Nettle juice and place it into the nostril. Nettle is an anti-inflammatory, easing the symptoms of benign enlargement of the prostate (prostatic hyperplasia) and other glandular enlargements, including goiter (abnormal enlargement of the thyroid gland). Hay fever and other allergic disorders are helped by Nettle. An alterative, Nettle enhances the absorption of nutrients from food and excretion, restoring normal body functions. A nutritive, Nettle contains rich stores of nutrients which are building to body tissues. This herb is useful in the treatment of malabsorption syndrome, an alteration in the ability of the intestine to absorb nutrients adequately into the bloodstream. Anemia is a condition that occurs when there is reduced hemoglobin in the blood. This causes fatigue, breathlessness, and a pale skin tone. Nettle can be used as a tonic which revitalizes and treats anemia. It’s high vitamin C content helps prevent scurvy. Nettle Tea can be used as a blood purifier. Care should be taken to either consume the herb fresh or preserve the herb by drying, tincture or other means because this plant begins to lose its nutritive value when harvested. Nettle helps to lowers abnormally elevated blood pressure, classifying it as a hypotensive. A diuretic, Nettle increases the production and elimination of urine, supporting the kidneys and bladder. Gout is a painful condition that results from accumulation of excess uric acid in the bloodstream and joints that cause joint destruction, kidney stones, and arthritis. Consumption of Nettle has proved beneficial in the treatment of this condition. Because of its diuretic properties, Nettle will help the body shed excess pounds due to edema. However there are additional properties of Nettles that support weight loss. Nettle is useful as an expectorant, promoting expelling of mucous secretions from the air passages. An anti-asthmatic, the juice of the roots of Nettle leaves can be mixed with honey or sugar to relieve bronchial and asthmatic troubles. The dried leaves can be burnt and the inhaled incense will have the same effect. An infusion of Nettle seeds/leaves can be used to treat consumption (wasting away of the body, particularly from pulmonary tuberculosis – also known as tuberculosis). A tonic used as a remedy for gout and rheumatic pains. In large stainless steel pot, combine 2 gallons cold water & equal volume washed young Nettle tops. Add 3 or 4 large handfuls of dandelion, of cleavers (goosegrass: Eleusine indica), and 2 or 3 oz of grated fresh ginger root. Bring to a boil, and simmer gently for 40 minutes. Strain off liquid and return to the pot. Stir in 1 1/2 cups raw sugar (turbinado or brown sugar). When the extract is lukewarm, combine 1 heaping tablespoon of active dry yeast with 1 teaspoon of sugar, and enough warm water to make a thin paste. Spread the yeast mixture on a slice of dry toast, and float it on top of the extract. Keep the pot fairly warm for 6 or 7 hours, while it works. Then remove the scum and stir in a tablespoonful of cream of tartar. Bottle and cork securely. Other herbs are often added to nettles in the making of this herbal tonic, such as burdock, sassafras, meadowsweet, wintergreen, birch sap, and horehound. Nettle is one of the few wild plants still gathered each spring in the country for food. These leaves make a refreshing dish of spring greens. This bitter herb has a slightly laxative effect. The young tops should be gathered when 6 to 8 inches high. Gloves should be worn to protect the hands when picking them. Wash the Nettles in running water, stirring wit ha stick. Place wet into a saucepan without any added water. Cook with the lid on for about 20 minutes. To serve, chop the cooked vegetable, serve plain, or warm again in the pan, using salt, pepper and butter to taste. Nettle goes nicely with gravy and poached eggs. Nettle leaves are also a nice addition to vegetable soup. In autumn, however, Nettle leaves are gritty and not so enjoyable for the table. In Scotland, Nettles are used with leeks, broccoli and rice to make Nettle pudding. Thoroughly wash 1 gallon of young Nettle tops. and 1/4 lb. of rice. Clean the vegetables well; chop the broccoli and leeks and mix with the Nettles. Place all together in a muslin bag, alternately with the rice, and tie tightly. Boil in salted water, long enough to cook the vegetables and rice. Serve with gravy or melted butter. These quantities are sufficient for six persons. Nettle fiber is very similar to Hemp or Flax, and it has been was for the same purposes. After the Nettles had been cut, dried and steeped, the fiber is separated, and then spun into yarn. This yarn is considered particularly useful for making twine for fishing nets, the fibre of the Nettle being stronger than those of flax and not so harsh as those of hemps. When Germany and Austria ran short of cotton during the War, the value of the Nettle as a substitute was at once recognized. Dried and powdered Nettle is considered an enriching additive for poultry feed, increasing egg-production and supporting healthy growth. The seeds are also said to fatten fowls. Turkeys, as well as ordinary poultry, thrive on Nettles chopped small and mixed with their food, and pigs do well on boiled Nettles. Some horse-dealers mix the Nettle seeds with oats or other food, in order to give the animals a sleek coat. The juice of the Nettle, or a decoction formed by boiling the green herb in a strong solution of salt, will curdle milk, making it a substitute for rennet when making cheese. The same juice, if rubbed liberally into small seams in leaky wooden tubs coagulates and seals the tub watertight. A decoction of Nettle yields a beautiful and permanent green dye for wool. The roots, boiled with alum, produce a yellow color suited for dying yarn or for staining eggs. Additionally, Nettle can supply a substitute for sugar, starch, protein and ethyl alcohol. A strong decoction of Nettle, drunk in large amounts, can produced burning over the whole body.